The self-described mission of the MIT Department of Athletics is “to bring students, faculty, and staff together in educational activities that promote healthy lifestyles, enhance a sense of community, foster growth in leadership and teamwork skills, and encourage the pursuit of excellence.” I don’t think the Health Fitness Corporation, the company that is running the new and “improved” gym, got the memo. 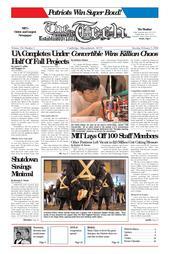 Their mission appears to be to extort as much money from the MIT community as possible. I’m sure I’m not the only one who is less than happy about recent changes in the way the gym is administered, but I feel like I should speak out for a couple of reasons. I’m an alum, so I actually have some free time to write this. I’ve been at MIT since 1994 and was a varsity athlete, so I remember how cool the gym used to be. Yeah, the facilities weren’t as pretty, but you were free to use them however you wanted. If you had no intention of ever setting foot in the gym, then you didn’t buy an athletic card (which cost something like $25 per semester). If you wanted to take gym classes, you could pretty much walk into any class you wanted and it was up to the instructor to say whether or not you could stick around based on the size of the class and the availability of equipment. Now that they’ve started offering classes for which you have to pay extra fees, the gym has suddenly turned into a bizarre police state. First of all, the notion of needing to pay for these classes is simply wrong. This is a gym for students. Students are poor. Students have to take gym classes to graduate, and classes should therefore be covered by tuition. Even gyms in the “real world” don’t do this. Imagine signing up for 8.01 and being told that it’s full, but you can sign up for 8.01L for an additional quarterly fee. Not everyone wants to work out on a treadmill or with weights, and people who want to take group exercise classes instead, should not be discriminated against and have to pay $300 more a year. To make matters worse, the free classes that compete with the pay ones are being restricted so that people who don’t get in have little choice but to take the pay ones. I have been taking the kickboxing class taught by Shan-Yuan Ho for more than a year. I would highly recommend this class for anyone who wants a serious calorie-burning workout. I’ve enjoyed this class more than any other cardio/aerobics class I’ve taken, mostly because it teaches real kickboxing and you learn something valuable, not just how to flail your limbs about as fast as possible. The class offers an aerobic workout, strength training, increased flexibility, and some serious martial arts skills. Its value is reflected by the fact that my hockey game has improved significantly since I started attending the class. Plus, it’s fun, the music is cool, the instructor is very personable and extremely knowledgeable, and you get to hit things, which is remarkably therapeutic, especially on those days where you get your problem set back and the TA has stapled a drop slip to it. When I started taking this class, it was about 50 minutes long. It has now been cut to exactly 40 minutes, but the pay classes are still an hour. And now I can’t even get in at all. I showed up to the first class over IAP and signed up for the waiting list early to get in. I’m staff and don’t need the class for credit, so priority should be given to students who do. I understand that and am comfortable with it. But if the room can safely accommodate everyone who is interested, then they should all be able to take the class. This particular class is held in the floor hockey arena on the third floor of the Z Center, so there’s quite a bit of space. The class was limited to 45 people by HFC even though there were more than 60 present the first day and everyone had plenty of room. The following week, on January 13, someone from HFC was there beforehand to make sure that only people on the enrollment list could take the class. Even though there were 31 people in the room, leaving space for 14 more people to join based on HFC’s limit, students were turned away because they were not on the list. About seven students stayed to follow the class out in the hallway on the linoleum floor. On January 15, 32 people on the roster showed up to class, and the same person from HFC was there checking attendance once again, so four people who were turned away worked out in hallway. This is just absurd. Creating a situation where students must exercise in the hallway is a safety issue and an inconvenience to other gym patrons. It was an unnecessary situation, since there was plenty of space in the class area. People come to this class because it’s a great class, not necessarily because they need gym credit. The kickboxing class epitomizes the athletic department’s mission. It’s educational: you get to learn some martial arts from a master instructor. It fosters growth in teamwork skills: you get to work with a partner to practice against an opponent. The fact that HFC doesn’t seem to appreciate that tells me that they are not interested in giving the MIT community a top-notch athletic facility, and I think the decision to contract management of the facilities to HFC should be re-evaluated. The athletic department should take advantage of the fact that the kickboxing class is so popular. If there were more classes like this one, which came free of additional fees, joining the Zesiger Center would be a terrific value for staff and alumni in the area. Students have to pay for the membership no matter what, but it doesn’t serve any purpose to anger them by tossing them out of a class or trying to get them to pay more money. The long-term effect is that they could easily grow up to be bitter alumni like myself who make life miserable for those poor sods calling from the Alumni Association to ask for money. I doubt that my pocket change will be missed, but MIT has gotten its last donation out of me. The good news is that I am not obligated to fork over the $200 Student Life Fee, so if I don’t think I’m getting my money’s worth or I’m not being treated fairly, I can just not renew my membership. It’s a shame students don’t have that option. Adriane Faust is a member of the class of 1998.